A Texas program that lets you trade in your clunker for cash is out of money in North Texas. Long before the federal "Cash for Clunkers" program, the state has offered government money for Texans' old cars. Texans who drive a car at least 10 years old or fail an emissions test can get a voucher worth up to $3,500 toward the purchase of a newer car or truck. "The vehicle that is being retired is what we maybe call a high-polluting vehicle," said Jason Brown, air quality operations manager for the North Central Texas Council of Governments in Arlington. "And the vehicle that they're replacing it with does have to meet engine emission standards." But unlike in other places in the state, North Texans can't double their clunker money. 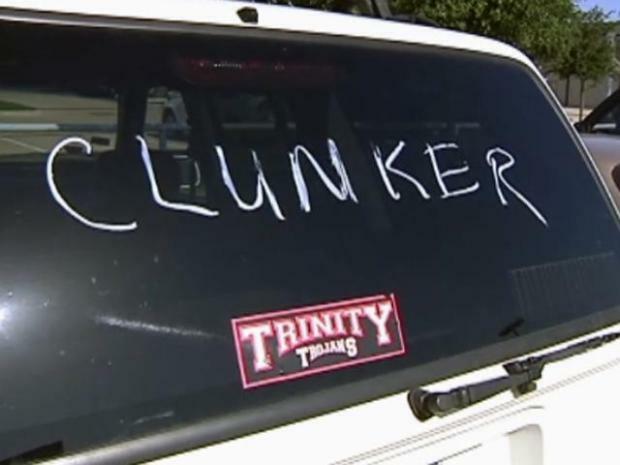 North Texans hoping to double their clunker money with a state program are out of luck for now. Funding for the state's Drive a Clean Machine program in North Texas ran out last month. It won't be fully funded again until September. In the Houston and the Austin area, car owners who qualify are able to nearly double their savings by cashing in on both Cash for Clunkers and the state's program. "It would be a terrific deal for the customer, because that could be $7,500," said Ken Thompson, of Classic Chevrolet in Grapevine. "If they get a hybrid, it would be even more." The savings can add up. An old clunker that qualifies for both programs could be worth up to $8,000. Program administrators are trying to get more money for North Texas now, while the Cash for Clunkers program is still available. "We hope that that would be before September first," Brown said. "But we're still working with the state closely to getting that resolved." Get more information about the state's Drive a Clean Machine program at www.nctcog.org/airchecktexas.